Who doesn't love a good bagel, people...especially here in NY?! Being a staunch bagel fan, I try to limit my intake since they're quite impactful on the waistline (and thighs). The bagels I'll tell you about here aren't like that at all, as they're little bagel balls filled with a shot of cream cheese in the middle. 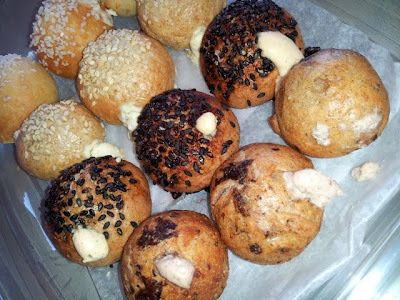 I'm talking about Bantam Bagel balls that are the newest innovation in bagel technology and they hail from the West Village. Occupying a tiny storefront on Bleecker Street in the West Village, Bantam Bagels are easy to miss if they're not on your radar. It's very much a take-out type of place, as there's nowhere to sit down, but you always the option to stroll down Bleecker street, find a nearby bench or park and enjoy a little bite of carbie goodness. 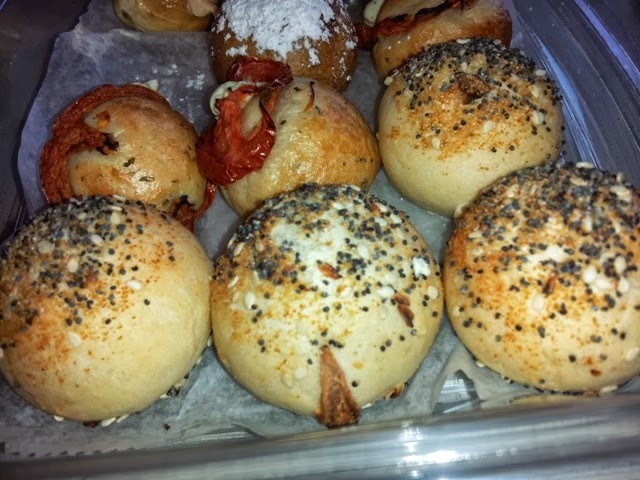 Ordering an assortment of 24 bagel balls, I loved the variety of savory and sweet bagels, including their fun, whimsy names such as the hot pretzel, cinnamonster, vegesaurus rex, grandma jojo, the hangover and more. Each bagel ball has a unique spin, whether an innovative bagel topping or an injection of a flavored cream cheese (and in some cases butter). Personally trying three of these varieties, including the Grandma Jojo, Everything Bantam, and the Pumpkin, I enjoyed them all but certainly had my favorites. Grandma Jojo stood out the most, both with its beautiful presentation (boasting a marinated tomato on top) as well as its slightly crispy exterior. The inside was soft and doughy with a pop of earthy basil pesto that was nestled inside. The pumpkin, which is this month's special was delightful as well, with black sesame seeds on top and a slightly sweet pumpkin custard middle. If you have a penchant for sweet things with a cinnamony flavor profile, you'll love it! Bantam's staff was a pleasure to deal with this morning, as they were cheery and very accommodating to my indecisiveness. They had a good way of giving me the right information about their bagel flavors and even managed to sell me a delicious cup of Gorilla coffee (roasted in Brooklyn). 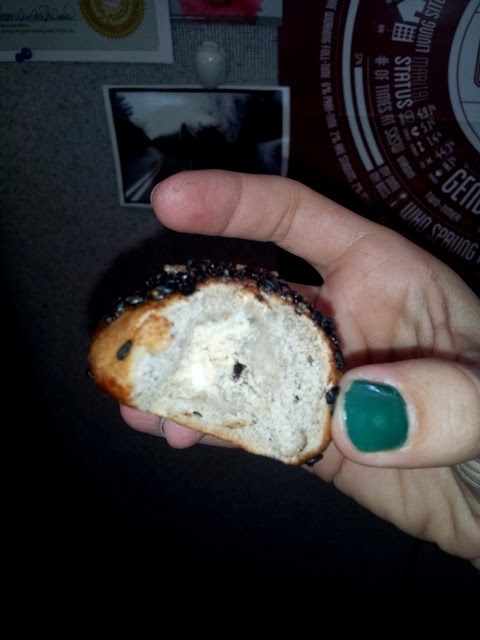 Costs are expensive for little bagels but totally worth it for a novel and flavorful product.